October is Breast Cancer Awareness Month, and there are so many fashion & beauty brands out there that are supporting the cause this month with limited edition items and beyond. Here are 9 brands that are supporting Breast Cancer Awareness and how you can support this great cause with your purchase. Get your workout on in style with this hot pink set from Koral. The brand will be donating 25% of the proceeds from the Advance Versatility Bra (in the Carmine colorway), the Lustrous Capri Legging (in the Carmine colorway) and the Villa Tencel Jersey Tank (in white) will go toward the Keep A Breast Foundation. Not only do these perfumes from Skylar smell absolutely divine, but they are going towards a great cause as well. For each bottle of perfume from the Love Collection sold in October, Skylar will donate $10 to breast cancer research. If you haven't tried Rails' ultra-comfy button-down shirts yet, you are missing out. 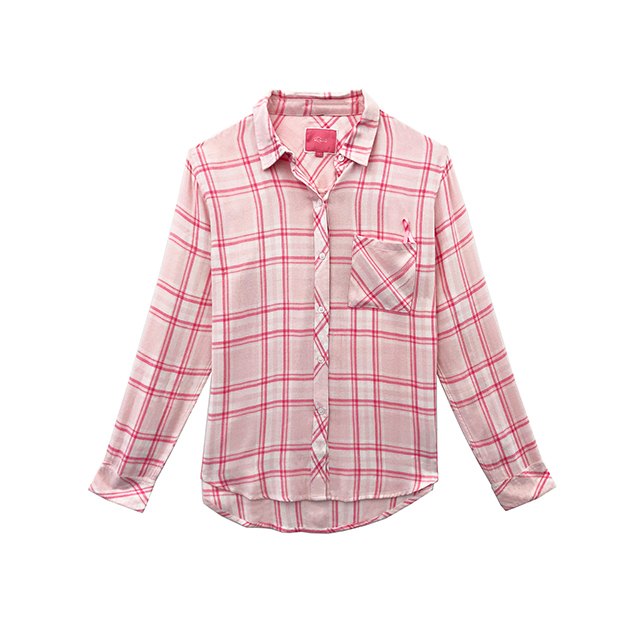 This sweet pink plaid shirt is so cute, and a great way to a plaid shirt without looking like a lumberjack. Bonus: for each Hunter "Love" shirt sold, Rails will donate its net profits to benefit Susan G. Komen®. In search of a new exfoliator? Sand & Sky's Flash Perfection Exfoliating Treatment works wonders on skin, gently scrubbing away dry skin, dirt, and oil while refining pores and increasing that glowing, dewy look. All through the month of October, 30% of the sales will go towards the Look Good Feel Better Organization. 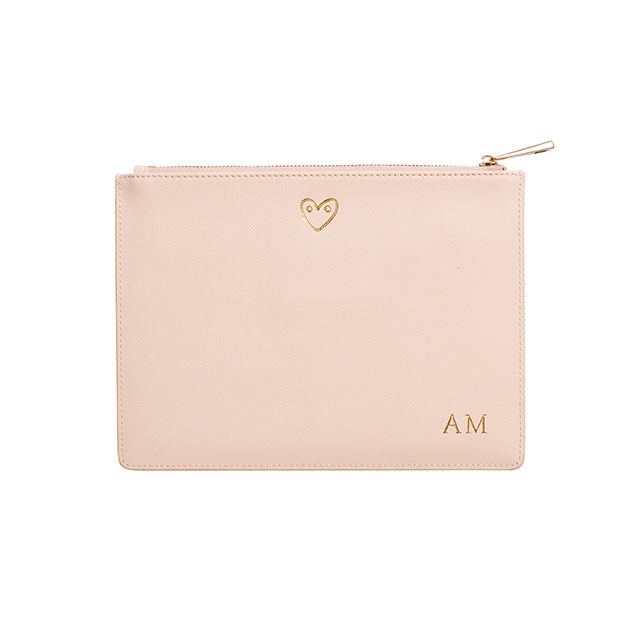 Keep all your odds and ends organized with a sleek millennial pink pouch from The Daily Edited. For each pouch sold, $30 will be donated to the National Breast Cancer Association. These two serums from Zaman Skincare are all you need to have beautiful skin from morning 'til night. The Rise & Shine Serum is packed with antioxidants, fruit enzymes, and essential nutrients to help even skin tone and moisturize, while the Sleeping Beauty Serum blends cumin seed and vitamin C to soothe irritation and reduce the look of wrinkles and redness. Throughout October, Zaman Skincare will be donating 30% of the proceeds to the American Cancer Society. Started by 901 Salon founders Nikki Lee and Riawna Capri, the BeYoutiful Foundation provides a powerful support system for women "defying the odds against cancer". When you purchase any of the BeYoutiful items available to shop, 100% of the proceeds go back to the foundation. For your next party beauty look, try this dazzling glitter gel from WUNDER2. The gel formula is less messy than your standard glitter eyeshadow and allows for precise application. Throughout Breast Cancer Awareness Month, WUNDER2 will donate 20% of each Amethyst Glitter Gelly sold to the Pink Ribbon Foundation. You can never have too many workout pieces, and this set from Celestial Bodiez is a fun addition to any workout wardrobe. Wear as a set, or mix and match with other pieces in your closet! When you purchase a pink item from their fall collection, Celestial Bodiez will donate 25% of proceeds to the Breast Cancer Research Foundation.